Pink and Red has to be one of my favorite color combo of ALL-TIME most loved. This outfit was one of my most loved from all of last year. Question: Does it ever bother you that part of your job involves so much consumption of material goods? Answer: I would be lying if I said it isn’t something I think about often. I have always loved fashion and truly do value, keep, and cherish almost everything in my closet. I make a very planned effort not to buy just to buy. Being a part of the fashion industry, and making part of my income based on promoting and wearing new items, I did start to feel a bit overwhelmed and ashamed of how much I was accumulating. Last year I made several changes to address this issue. First, I began to borrow more clothing from PR companies, friends, and brands, particularly for events and occasions where I would most likely be wearing a piece one or two times. I also increased the amount that I have been buying (and reselling) from used sited like The Real Real and Poshmark. I have also increased the ‘Edit & Etc.’ section of my site, which has me posting more collages and roundups, allowing me to talk about what trends and brands I am interested in, without necessarily having to purchase the products and wear them myself. And finally, I have been re-wearing items and showcasing them in new ways. I do think it is important for readers to understand that I don’t really wear something new every single day. In fact, most of the items that I promote I still love to wear in new ways years later. For example, the dress I wore in my very first outfit post back in 2010, I still own and wore last week! I am still finding a balance in all of this – educating and inspiring my readers with style and fashion through my outfit looks and editorial content – but doing so in a responsible way! I just recently wore this stunning red dress to a rooftop event here in NYC! 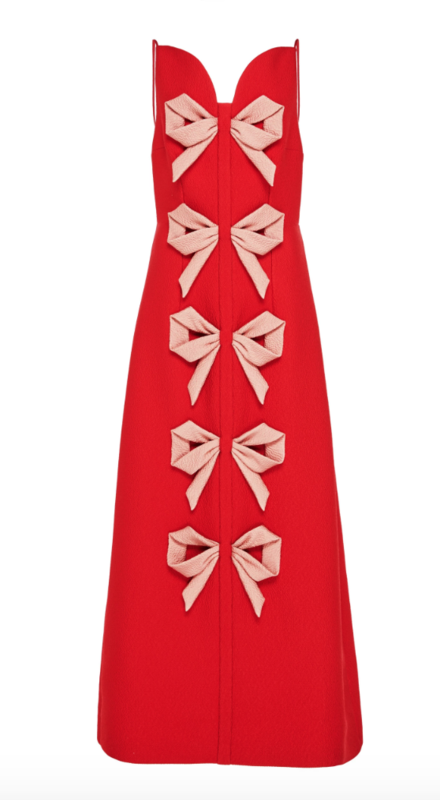 The colors, the bows, the silhouette – absolutely everything about this pieces makes me happy! The post No. 100 // MY FAVORITE COLOR COMBO appeared first on Atlantic-Pacific.